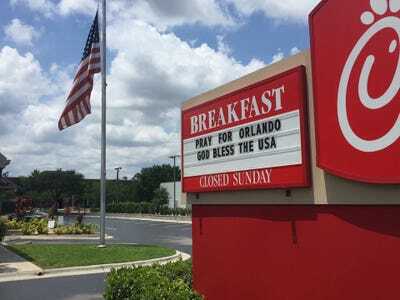 Chick-fil-A employees broke the company’s ban on working Sundays in the aftermath of the mass shooting in Orlando. “Thank you for the outpouring of love for the people of Orlando in light of the horrible terror experienced Sunday morning,” one customer wrote on Chick-fil-A’s Facebook page. the Baptist Press in 2012 that the company was “guilty as charged” for backing “the biblical definition of a family.” Following Cathy’s remarks, reports emerged detailing Chick-fil-A’s many charitable donations to anti-gay marriage organisations.